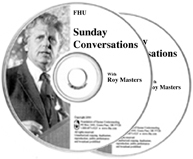 "Treason: Do Not Let It Go to Its Conclusion"
There is probably no one better than Advice Line radio-host, Roy Masters, to call a stop to what we see happening in America today. He tells it straight. Roy sees clearly that, “Divine order is missing in America,” but, unlike others, he knows how to get it back. Many of us are well aware of what it means to have our life taken away and given to others. Here you’ll see to the truth about our violating, parasitic, and codependent relationships; whether those relationships are found within our families or in the White House. Now is not a time for cowards, but that is what Americans have become. Find out how Roy is able to stand tall in “a war of energies and metaphysical forces.” And when he says, “I want to restore you to your families,” you may finally find a chance at that.